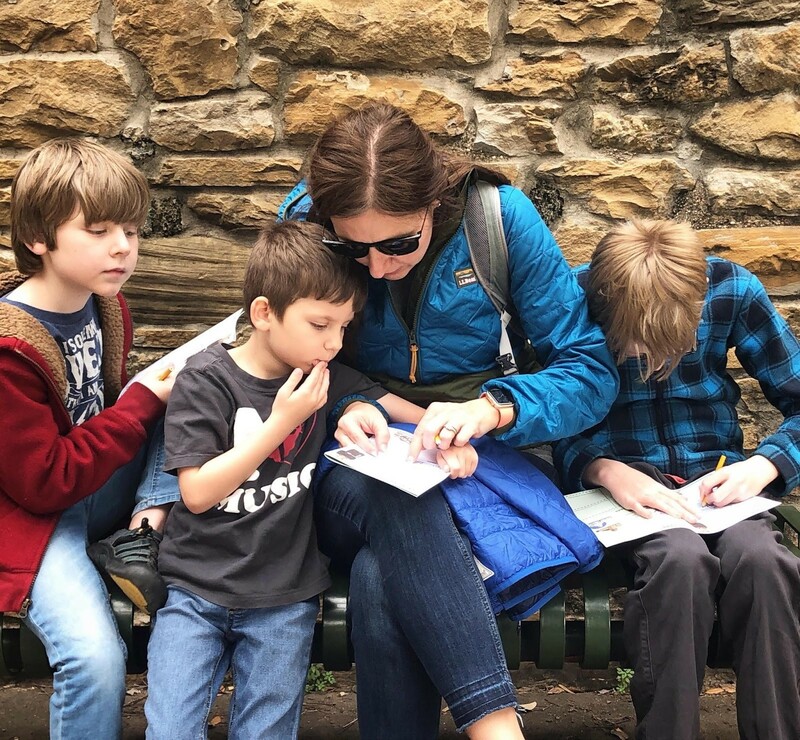 Designed to engage kids of all ages — and grown-ups, too — the Junior Ranger Program can range from a quick booklet to an all-day adventure. 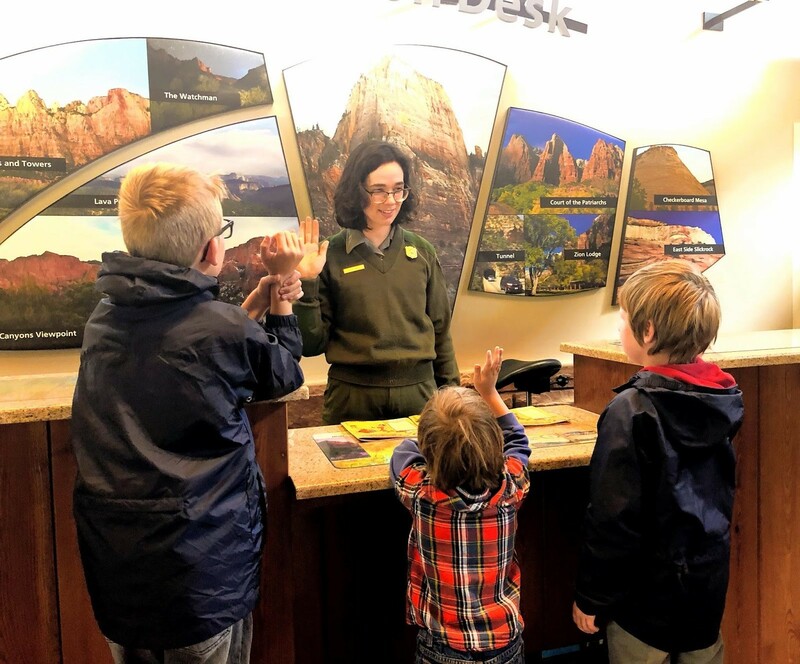 Through age-appropriate tasks, kids are asking questions, making choices, participating in park stewardship, and interacting with the National Park Service site they are visiting. Here, we will discuss a few experiences our boys have had with the National Park Service Junior Ranger Program. Recently, our boys completed their 22nd junior ranger badge at San Antonio Missions National Historical Park. They were asked to design their own fresco and to consider what items they would bring if they were indigenous hunter-gatherers. They were also asked to imagine what their surroundings would have looked like 10,000 years ago. That last question was made all the more powerful by the fact that the missions sit inside the city of San Antonio. Urban life was all around. 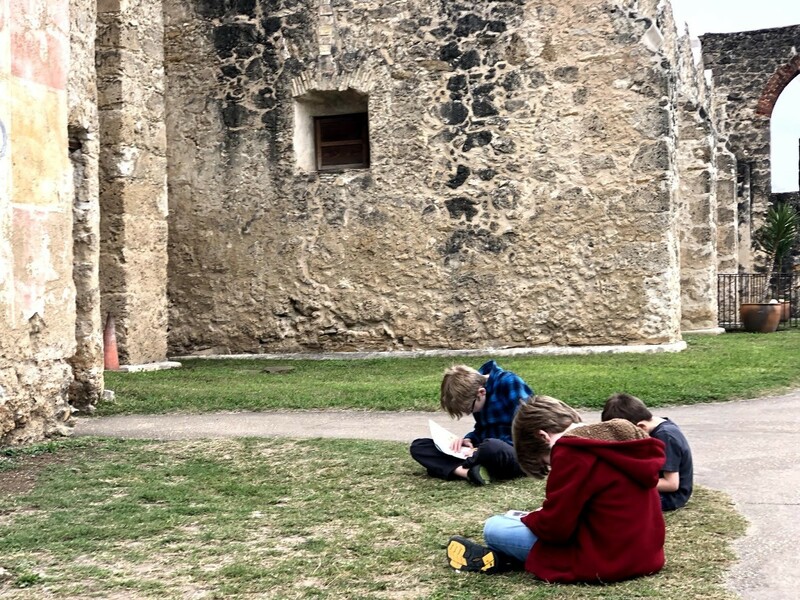 Working on our junior ranger badge at San Antonio Missions National Historic Park. 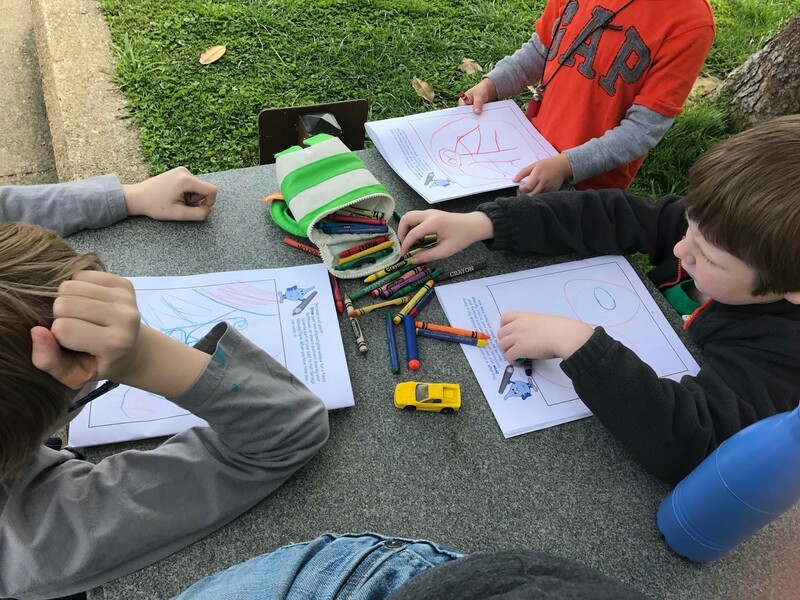 Creating their own fresco designs to earn their Junior Ranger badges at San Antonio Missions National Historical Park. Last fall, we spent a decent amount of time traveling the Lewis & Clark National Historic Trail. During those travels, our eight-year-old became really fascinated with The Corps of Discovery. He took a pretty serious deep dive and we would often find him pretending “Lewis and Clark,” so we made sure to offer him as much information as we could. We checked out hiking areas they traveled and visited the Lewis & Clark visitor center in Omaha, Nebraska. It was incredibly special watching him earn his badge to become a Junior Ranger on a topic he really enjoyed. (l-r) Ethan, Jack, and Henry after being sworn in by Ranger Hess at the Lewis and Clark National Historic Trail. Hiking along the Lewis and Clark National Historic Trail. 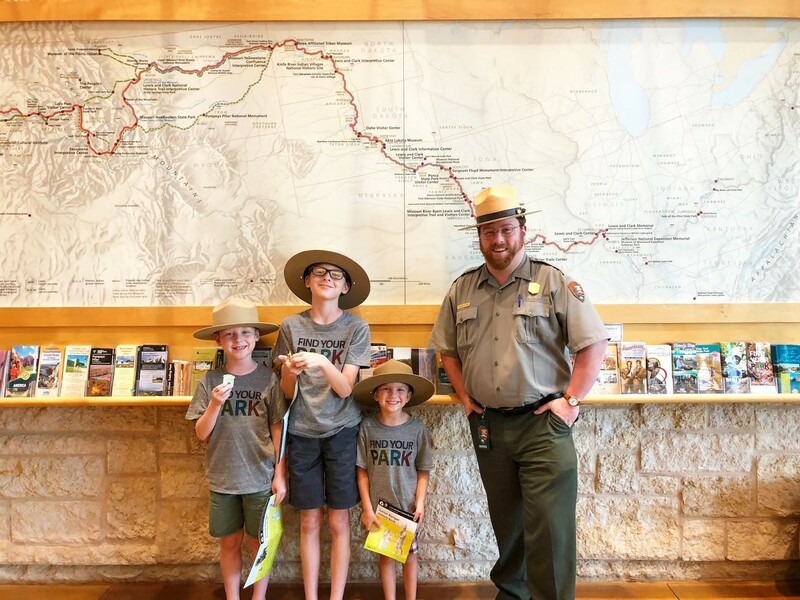 Our three boys have become rangers at Zion, Bandelier, Gateway Arch, Voyageurs, Hot Springs, Gulf Islands National Seashore, and many other parks. We’ve even visited Denali National Park in Alaska. But they aren’t the only ones learning about these amazing locations. The beautiful thing about this program is that I learn right alongside my kids. As I sit with them and go through their booklets, I, too, am searching for answers and contemplating the big questions. When we come home at night, we often talk about the park we visited. 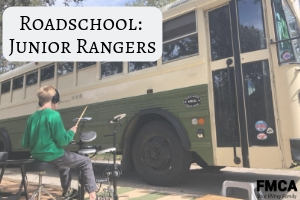 As we talk, we draw on facts we learned from the Junior Ranger program. I see their play align with a park we’ve just visited, and that only deepens their connection with what they just learned. 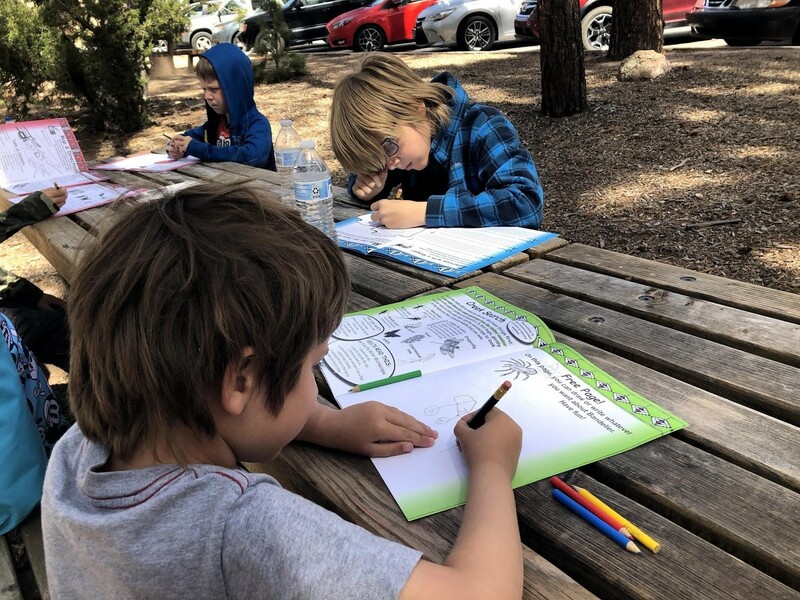 Working on our badges at Bandelier National Monument in New Mexico. Becoming Junior Rangers at Zion National Park. The sense of learning (for all ages) is what makes this program so special! It has the potential to light a fire under a child and bring to life places and spaces they may have never heard of before. You don’t have to be a full-time traveling family to enjoy the Junior Ranger program either. 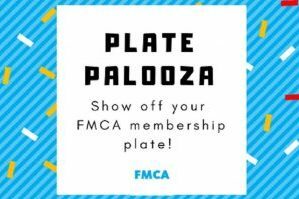 Most booklets can be done in a single visit, or you can take it home with you and mail it in at a later date. We have had booklets that have taken no time at all, while others we’ve taken home and worked on together. There are also booklets that we really took our time with and spent the entire week finishing. 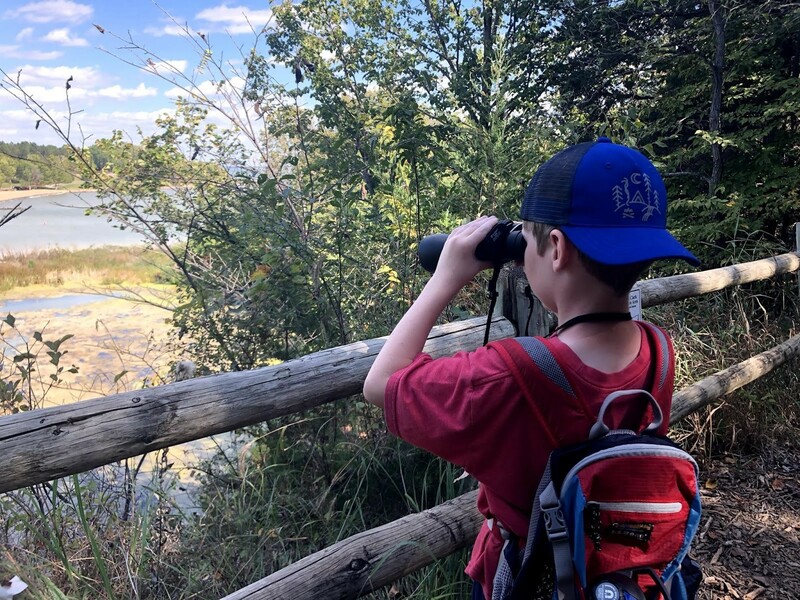 The National Park Service does a great job of knowing that kids and their grown-ups are traveling at their own pace and that it’s important to have a Junior Ranger program that can accommodate all kinds of visitors. 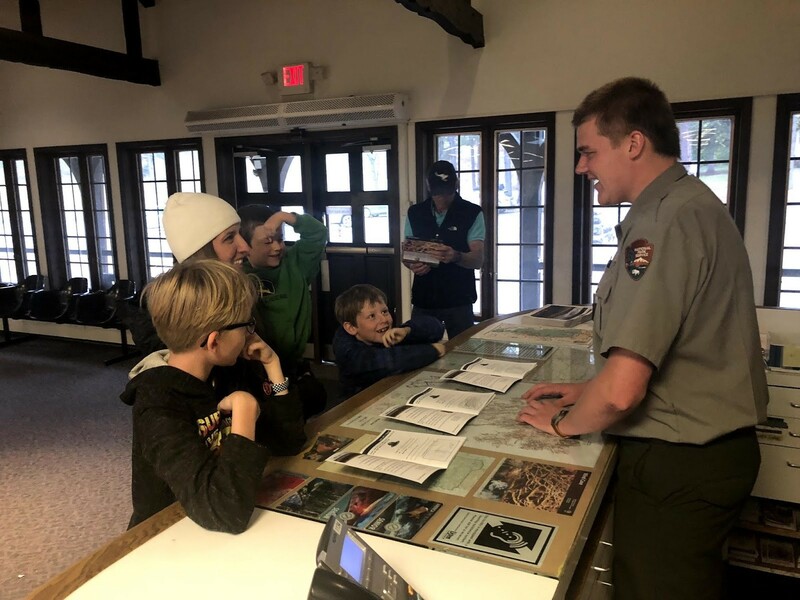 Chatting about our Junior Ranger booklets with a ranger at Wind Cave National Park. We love and appreciate the Junior Ranger program. It enhances our roadschool experience and it brings more than 400 National Park Service sites to life for our kids. Plus, it makes their mom feel all kinds of feels when they take their oath to protect and preserve. The next time you find your family at an NPS site, ask for a Junior Ranger booklet. I dare you not to tear up a bit as you watch your kid be sworn in by a ranger…. 22 badges later and I still get a lump in my throat. What are some of your favorite national parks to visit? Comment below with some of your favorite things you’ve learned in your travels! Abigail Epperson is one of the five wanderers that make up Our Wandering Family. Along with her partner, Jason, and three boys, Abigail spends her days traveling the country in a 2002 Thomas school bus conversion. She’s the Publisher of RVMiles.com, a travel site dedicated to the RV and outdoor lifestyle. She is also a co-host of the RV Miles Podcast and the America’s National Parks Podcast. In a previous life, she was an actor/director. In this current life, she still fulfills her need for theater as the Managing Editor of PerformInk. When she is not in our national parks, you can find Abigail drinking coffee and doing all things social media for Our Wandering Family on YouTube, Instagram, Twitter, Pinterest, and Facebook. To read more about the Eppersons’ travels and life as a full-time family on the road, visit OurWanderingFamily.com or check out the RV Miles Podcast.